As part of the Eclipse Git migration, SWT has moved all of its CVS projects into 2 Git repos - one for sources and one for binaries. The git homepage has a documentation section with good links to tutorials. The online Pro Git book provdes a more comprehensive overview of Git. 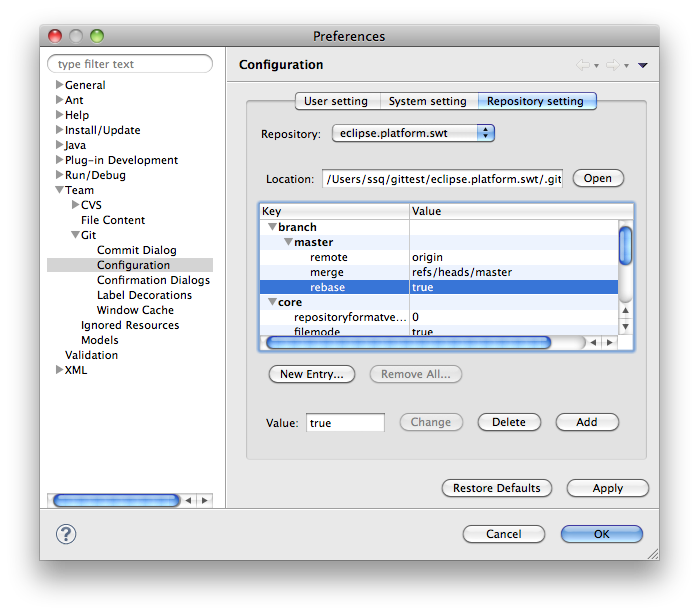 While it is possible to use git only from the command line to develop SWT, it is recommended to use EGit to allow you to perform all git operations from within Eclipse. Here is a quick guide to help you get set up (see also Platform-releng/Git Workflows page for more workflow hints.). The EGit User guide can be found here. You can install EGit 1.0.0 from Indigo, it's already available. From within Eclipse, you can select Help>Install New Software... and then select the Indigo site from the 'Work With' combo box. 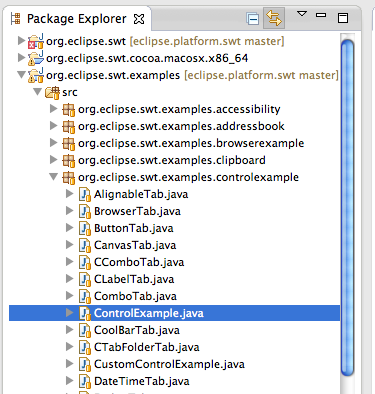 Select Eclipse EGit from underneath the 'Collaboration' section and install. Getting the source is a two step process. 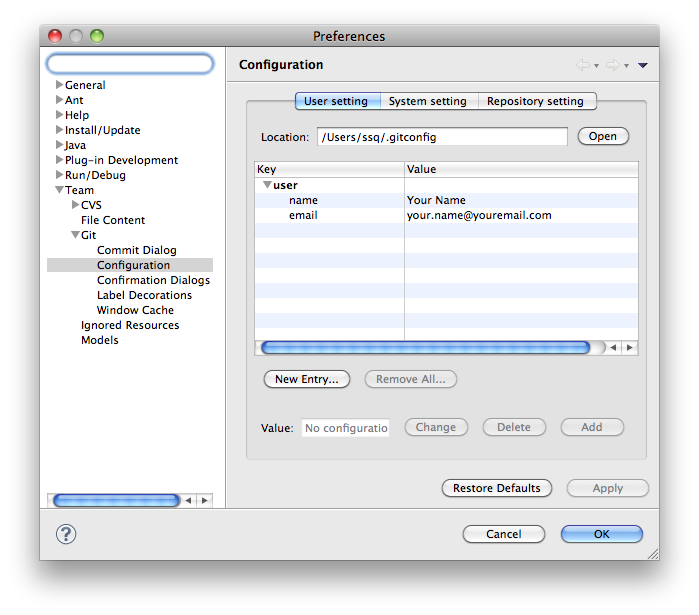 First you clone the repository to the location specified in the Git preferences pages, and then you must import the repos into your workspace. Note it is also possible to clone the repositiories via the command line tools and then just import them into your workspace. Switch to the Git Repository Exploring perspective. Paste one of the following URIs into the URI field, and EGit will fill in the rest for you. When finished, click Next. Select master and any other branches that you are interested in. Click Next. 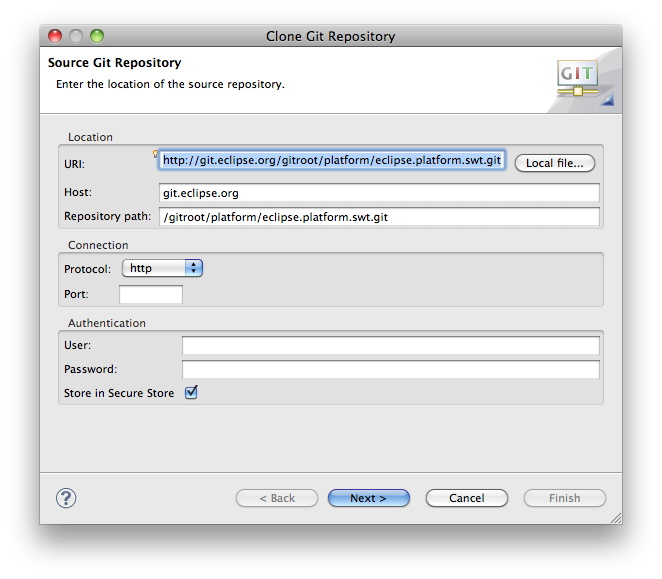 Note: If you have cloned the repository with EGit you can skip this step. This step is just for people who have cloned a repo from the command line and want to import it. Browse to the directory that contains the repo and click search. Select the found repos and click OK.
Once you have a repo cloned, right click on it and select Import Projects... (These screenshots show importing the source repo first). 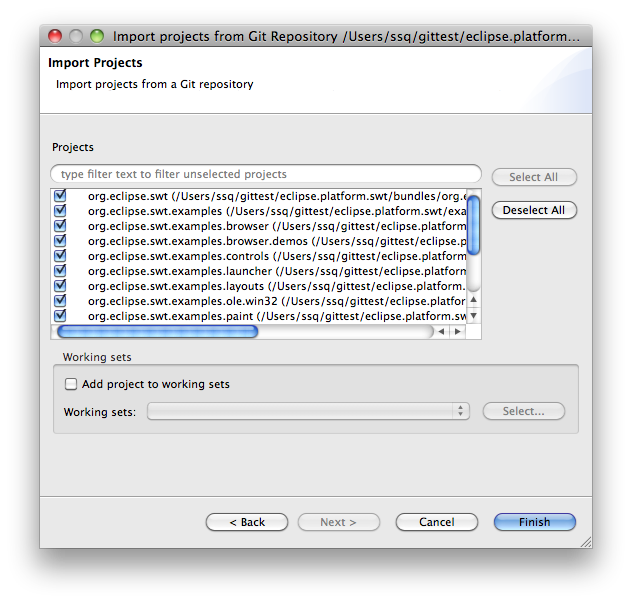 Choose Import existing projects and click Next. Select which projects you want to import and click Finish. Although you can import all projects from both repos, it might be better to select only the minimum set of projects you are interested in to keep your workspace small (for example, org.eclipse.swt and org.eclipse.swt.cocoa.macosx if you are doing Cocoa development). 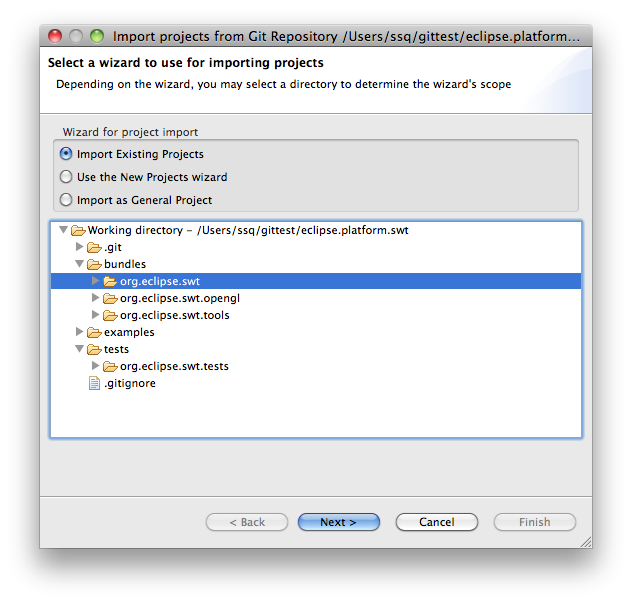 Now repeat the same steps to import the other repository into the workspace. 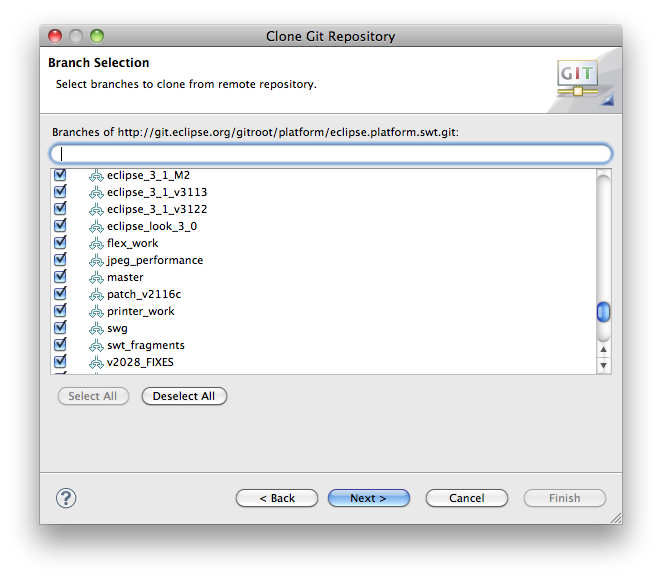 Open Eclipse Preferences..., and expand the Team item in the tree. Under the Git item, select Configuration. Check the user name and and email - this will be used on all commits. Next switch to the Repository Settings tab. Under the branch tree, select the branch you are working on (most likely master) and create a new key with a name branch. [branchname].rebase and a value of true. 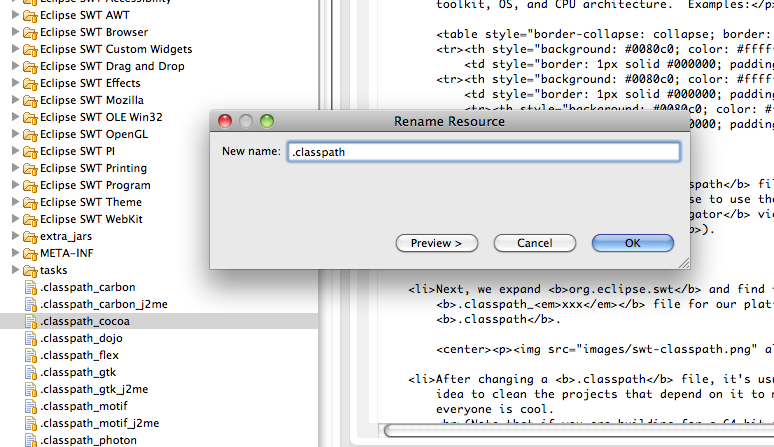 This will ensure that the history will stay linear when merging in changes from the remote repository. 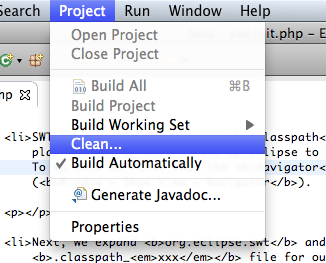 Once you have imported the projects from both eclipse.platform.swt and eclipse.platform.swt.binaries into your workspace, you are ready to switch the classpath to match whatever platform you are runnning with.